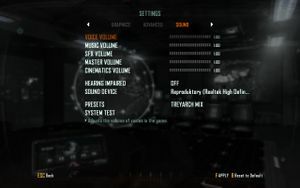 BO2 Optimizations Summary - Useful optimization list thread. Mission cutscenes automatically play until the mission level is loaded, upon which a left click will allow skipping. This will disable the game intro video which forms part of the campaign storyline. You can keep this by not deleting intro.webm. There are several configuration files in the players folder but only bindings_sp/mp.bdg is unencrypted. There is a "Texture filtering" option with low, medium and high settings. Multiplayer is capped at 200 FPS. Set in Options. Changes green and red elements to blue and orange. 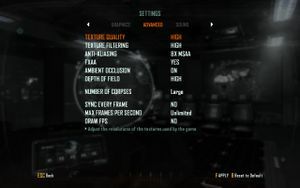 A comparison of video setting image quality can be found on the GameSpy Port Authority. No mouse acceleration, with no option. 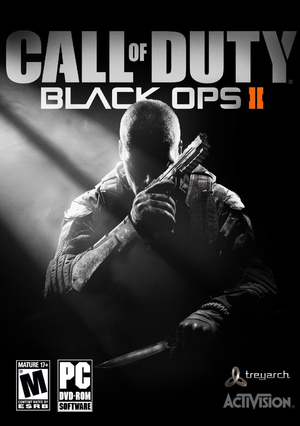 Master, SFX, Music, Voices, Cinematics. Download the modded archives here. Change the language of the game to English. Paste the downloaded files over the existing language files. Having an "open NAT" is important for VOIP, joining/hosting a party and private matches (this may require a static IP). Zombie mode 4 player co-op. Frame rate drop while aiming down sights. Set Depth of Field option to low without significant visual impact. Additionally you can turn off Ambient Occlusion and FXAA which affect the speed when aiming down sights. Significant mouse lag with vsync enabled. If you're experiencing mouse lag from vertical sync and screen tearing without it, selecting Borderless Windowed mode from the video options menu may solve the issue. These steps should fix the error, but they reset all of your stats. Please be aware that, by usng Cheat Engine or similartools, you are highly exposed to the risk of being banned by either Treyarch Anti Cheat or VAC. Download a memory address editor (like Cheat Engine). Run the game. Go to barracks. Use an editor to change the value of address '02e97ca4' (version 21.406.7) to 5. Go to 'Prestige mode' and then click 'Prestige Awards'. Select 'Fresh Start'. Your stats should now be reset, and the error shouldn't come up anymore. ERROR: sound Bank failed to load cmn_root.Englisch. You have a Build Problem." Solution : Set the language of all three game parts (singleplayer, multiplayer and zombies) to your desired language and wait for Steam to finish downloading. Crash during campaign whenever Career Record is displayed, or in Zombies whenever Leaderboard is displayed. Caused because of bug displaying more than 60 and less than 100 Steam friends. Delete friends list until total is under 60, or add more friends until total is over 100. Set Steam in Offline Mode. Verify local files for singleplayer and then multiplayer. 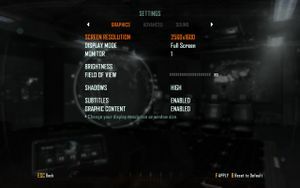 Monitor may support 1920x1080, but highest available setting may be 1440x900 or 1680x1050. Set the windowed mode to Windowed (Full Screen). The missing resolution will now be listed in-game. Users have the option of installing the campaign (~8.7 GB), multiplayer (~4.5 GB), and zombies (~1.0 GB) separately. ↑ 2.0 2.1 File/folder structure within this directory reflects the path(s) listed for Windows and/or Steam game data (use Wine regedit to access Windows registry paths). Games with Steam Cloud support may store data in ~/.steam/steam/userdata/<user-id>/202970/ in addition to or instead of this directory. The app ID (202970) may differ in some cases. Treat backslashes as forward slashes. See the glossary page for details.